Lightweight Cello Case - Only 3.75kg! The Orchestra Carbon Cello Case is a lightweight and secure way of storing and transporting your cello. Made of a carbon composite shell, this case weighs only 3.74kg; approximately half that of a standard case. Featuring eight locking clips and a moveable padded block interior, this case will keep your cello safe in transit. Shoulder straps along with vertical and horizontal carry handles mean that the cello can be moved around really easily. 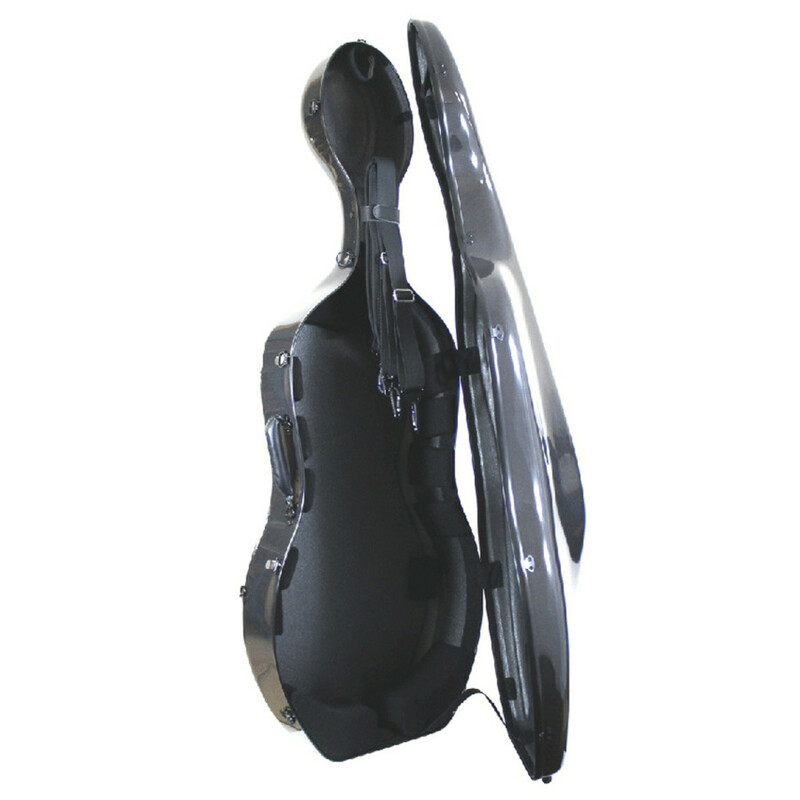 The Orchestra carbon cello cases are desgined with lightness protection as its key aim. Weighing only 3.75kg, this case is incredibly light in comparison to many other cases on the market. Made from a carbon fibre weave composite, the cello case aids those that have to carry their instrument around for long periods of time. Strength has not been compramised though, the carbon weave makes the case very strong, which is great if the cello needs storing in luggage holds or if it gets knocked over. The Orchestra Cello Case provides a custom approach to padding. The padded blocks inside the case can be moved to suit the shape and style of the cello if required. The padded neck restraint includes a Velcro grip to support it in transit. There is also an elastic retainer for the scroll of the cello for ultimate protection. This cello case includes shoulder straps, which can be mounted on to the three rivited anchor hooks on the case. This makes moving the cello around really easy and comfortable. As well as that, there is a horizontal carry handle between the bouts of the case and a vertical handle around the neck position. All these handles make it easy and comfortable to carry the instrument to rehearsals, concerts and lessons. Despite being a lightweight case, there is still room for accessories. In the head interior of the case, there are holders to accommodate two bows and at the head end of the case, there is a pocket for rosin and other smaller accessories.